Culture. In our hearts and soul. Believe. The Power of a Word. I admit that my job can overwhelm me at times. I have been in the same position for the past 10+ years. As the process in my role continually increases, I have difficulty keeping up with the workload. I feel like I am playing ‘pop-a-mole’. The faster I work, the further behind I get. My computer doesn’t respond fast enough and new systems continue to add process. I work to get everything under control but don’t feel like I am having success. It is very easy to get frustrated and as much as people stress me out, I recognize that I stress them out. And that was before the company I work for was purchased. Now there are significantly more changes on the way. A massive layoff meant that those of us who are left have a heavier workload. We had already felt overloaded. Now we are overwhelmed. I view this as an opportunity to work with LOGOSYNTHESIS®. My mission is to self coach myself for success in this environment. 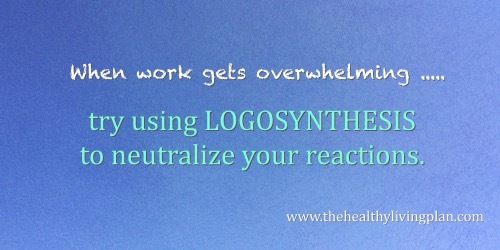 I believe that I can use LOGOSYNTHESIS® to neutralize my reactions to everything that is happening and stay focused on prioritizing my workload. I don’t feel that I need formal support and I can use this unique tool in my free time. The results intrigue me. In one situation, I was exploring my frustration that senior management didn’t understand the challenges of employees in my role. Some of the restructuring changes did not make sense. I held a strong belief that if these people held senior roles, they should know better. Hmmmm. That struck me as an interesting belief. ‘People in senior management should know better’. I decided to work the sentences on this belief, acknowledging my reactions to the fact they don’t know better. As the sentences processed, the next words that I heard repeated in my mind were ‘They should know better. I shouldn’t have to say anything.’ I said the sentences for this belief and for my reactions to the fact that they didn’t know better and I did have to say something. Next I was recalling a childhood experience whereby my mother would regularly take me to the doctor because I was sick. We would wait forever in his office and when we finally got to talk with him, we felt rushed. I had a hard time explaining what was wrong with me, although I thought that my stunted growth was an obvious indicator that something was wrong. During one appointment in my mid-teens, he informed my mother in an authoritative tone that I would not be any taller than 4’11”. She was told not to bring me back because there was nothing wrong with me. I suffered from undiagnosed Celiac Disease until I was twenty. In all fairness, Celiac Disease was not readily diagnosed at the time however, I felt that if he was in that job, he should have known better. Hmmm… ‘If he is in that job, he should know better’. One more set of sentences to work on my belief that my doctor should have known better and my reaction to the fact that didn’t know better. I could feel the energy in my core shift. Over the years, my reactions to the fact that people in senior roles don’t know better have not always been appropriate. As I use the sentences on this archaic energy structure of the doctor’s words, I can begin to neutralize my reactions in current situations. As I free my energy, I can focus on acting rather than reacting. My goal is to be present to do the best job possible.